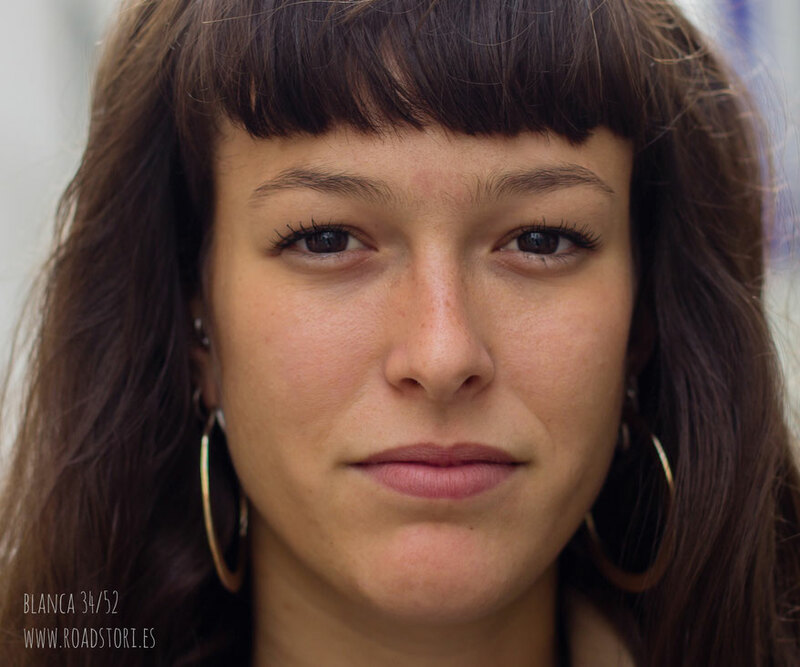 I met Blanca during her exchange semester in sculpting at the Alanus Hochschule for Arts and Social Science, being really amazed by her confidence and joyful way of being. Blanca studied art and sculpting in her hometown Barcelona. At the moment, she is doing a certification course for German language in Cologne, where she will start to study art and new media next year. What makes me happy... When I go to bed and think about the day I had... if I worked and had a fruitful day, then I feel happy. When I come to a point where I agree with the time I spent and the attitude I had facing situations. Work makes me happy, mostly my artistic work. Because that's what I do and what I stand for. That's the pursuit of my life, working with art. But also if I help someone. But what makes me happy - Meeting people, travelling... but I think in the end, it is about feeling as a whole. It makes me happy when I achieve my goals, but also in general, when I am feeling that I am really in the moment - no matter what my problems may be, what I have to do tomorrow, what I ate yesterday... When I am just enjoying this exact moment. When I am really into something, working with art, I feel some kind of infinity. When all the noise around fades away and I am just in that present moment – that also connects to feeling whole. It can be while … floating in the sea. Being really in the precise moment, doing what you wish to be doing in this exact moment and nothing else, makes me feeling as a hole and feeling happy. When one is complaining about the surrounding, you are no more able to simply enjoy the moment. Another dimension may be that it makes me happy when Russia and the US decide to not fire anymore. When I feel peaceful – and this is for me about being in the moment – then I am happy. Maybe tomorrow I'd give you an other answer, but I think the core would be the same. Feeling whole. Home. This is for me also linked to the first question, about when one feels happy. My home was Barcelona, where my family is, but when you grow up, you decide where your new home will be. Home is a place where I feel comfortable, where I feel loved – also by myself, it doesn't necessarily depend on other people. When I feel happy. Sun and Sea are home. Home is when I have the stability to build something. When I returned to Barcelona after I have lived somewhere else, I started having really weird, strong nightmares in my former house and I realised, that my home wasn't there anymore. My family and the people I love, the ones that unconditionally will love me and support me, are there, but it is not my place anymore. And it is anywhere at the same time, I am just carrying it with me. Also, when I am visiting close friends of mine in Montserrat, I feel incredibly comfortable and at home there; home to me isn't a physical thing, it is made out of the whole circumstances, the people, the spirit of a place. Since one month I am living in Cologne and sometimes, when I am riding my bike through the streets, I already get a glimpse of things, that aren't unknown anymore. Maybe it is connected with me feeling happy with myself, something about the attitude you have. Menorca also holds a special meaning for me. Even the memory of how I feel when I am there makes me feel good, so it's the work of melancholy or something like that... Since I was born, I spent my holidays there. Also the memories of things and places make me feel at home, but I am also feeling at home anywhere where I feel comfortable with myself. The conversations with my father shaped me from a very young age. We are pretty connected, we are pretty similar. He is my “Maestro” in life. Then, a moment in my life where I was really, really tired about myself about not stepping into something – I was always like “Oh, I would like to do that or that...”, complaining about what I would like to do – I was so tired of this behaviour of mine, that I finally broke with everything – not physically, but mentally – and focused on art, on my work. It was from my second to the third year in university, when I was twenty. This period of time when I took the decision to step forward and focus on art, really really started things going. I was going on and on, I had the feeling that I really started my life consciously. Stepping out of this complaining, starting to act and doing something. A third thing, that brought me to where I am now, may be – material things, the beauty of materials. Well, everything and anything can be applied to what I am saying. “Material” to me are unknown things, that evoke my curiosity. Curiosity is, what brings me here, maybe just curiosity. I've always been curious, always – that also started the conversations with my father, because as a child, I asked tons of questions about everything. Also the feeling of being tired of myself came through that curiosity; I was curious, but held myself back from exploring. Also in the material; I want to understand what I see, what I have in front of me, what I read... I want to find answers. I am not saying that there is an answer to everything – but just asking yourself, if there are any is essential to me. In moments of crisis, times of dought, when I find myself asking questions like “Why am I here” and “Where am I going” - this is fear! It is a fear of myself. The only thing I am afraid about is myself! Pretty difficult to explain... And what helps to overcome fear: Just the realization: I can't stuck here; I have to keep going! Like many other children, I was afraid of darkness. When you can not see, you can not go on; but when you're in the house, you can not stay where you are, being too afraid to move; in the end, someone has to switch on the light! And then you go for it. So maybe realizing that you cannot stay in some place, that you have to keep moving. Because when you get stuck somewhere and won't move anymore, you will die. Movement is life. Sometimes, also the power of movement makes me afraid; but then I relax myself, that this is just normal. One year ago, I was living pretty much in my comfort zone. Now I am here, new country, new language, new university, new everything – but that also leads to a stage where one can excel. I am overcoming fear through the realization that I can't stay stuck and that I shall and I must go on. Then, fear will somehow go away. Blanca's question: What's the most difficult task you ever faced or you might face? I agree in some Points. able to make free descissions despite theire determinations. into work or other distractions. But thats just what helped me! Everybody has to find out on his own.